I'm excited to share one of my recent projects with you. It is honestly really easy and SO MUCH FUN when it's all done. I'm going to show you two versions today. One is made with a sewing machine, and the other is completely no-sew, yay! There's nothing happier that gold sparkly triangles all in a row. It's such a perfect backdrop for any party. Of course, you don't have to use gold, sparkly paper. You could use any card stock that fits the theme of your party. When we decided to have a little New Year's Eve party, I knew I wanted some fun pops of gold and black in the house. A trip to Michaels and about an hour or two later, I had the most fun backdrop that can be used again and again. I'm hoping to break it out another day soon, either for another NYE gathering, or maybe in hosting a shower one day. Line your ruler up to one side of the back side of your card stock. Make a small line every three inches, at 3, 6, and 9 inches across. Repeat for all four sides of the paper. Then, draw a line that connects the 6" marks that are directly across from one another. You'll have four 6"squares at this point. Now to make some triangles! Use your ruler to draw a line between the three inch mark on one side and the 9 inch mark on the other side. Next, draw lines that connect the 3 inch mark on one side to the 6 inch mark on the next side. Each piece of 12" x 12" card stock will produce 6 equal triangles. If you're paper-conscious and want to save money, you can certainly take the four left over pieces and put them together to create two more triangles per piece of paper. Once all 30 are cut out, you're ready for the next step! Prepare your sewing machine with a coordinating thread color and have your bias tape ready to go with your triangles nearby. With the bias tape opening to the left, begin sewing a "tail" end of the bunting. The length of this may depend on how you plan to hang your decoration. I only left about 6 inches at each end of mine. Once you've sewed a long enough "tail", you can insert your first triangle between the folds of the bias tape. Then just sew right over it! Be sure to make sure that the paper is as far into the bias tape as possible. I left around a 1/3" between each triangle. I didn't measure, just eyeballed it. You could certainly leave more space between each one if you like that look better. Then just keep going until you reach the end of your bias tape. I had a few triangles left over at the end, which I used for my no-sew version. Be sure to leave another tail at the end of the bunting, about the same length as the beginning. Sew all the way to the end, and you are done, my friend. Now, hang up your bunting, and admire how cute it looks! ONce you've cut all of your triangles out (per the instructions above), you are ready to cut. Turn the triangles around and cut about a 1/4" slit at each top corner of the triangle. Be careful not all the way through to the top. Repeat with all of your triangles. Next, thread the ribbon trough each slit. You can have the ribbon in the front of the triangle like I did, or you can have it in the back. They are both equally stable. Be sure to leave a small "tail" at the end and beginning of the bunting for hanging purposes. Keep threading your triangles through until your bunting is as long as you'd like. Here you can see both bunting versions. I'm holding my mini no-sew version, and hung above me is the sewing machine version. Both are perfectly adorable and ready for your next celebration. I hope your new year is off to as great of a start as ours is! Cheers to you and yours! Love this!! I want to make this for my bachelorette weekend in Nashville haha. Also I have to say--we were going to make those "Pop the Champagne" shirts for the weekend! I found them on Pinterest and I absolutely love them. Too funny to see it on you! 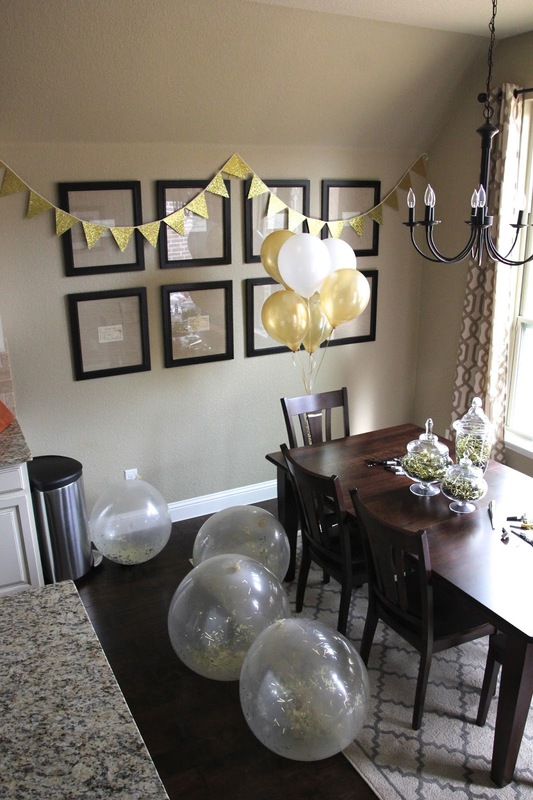 Very attractive design and impressive work for the decorating purpose of this party. Thanks for this tips. Will try for the real one. Thank you very much. Adorable. Making a bunting has totally been on my to-do list. Yours is super cute!